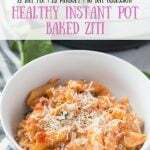 Save time and make this Healthy Instant Pot Baked Ziti for the 21 Day Fix whenever you are craving a bowl of warm and cheesy comfort food! Packed with protein and veggies, this Healthy Baked Ziti is gluten-free with a dairy free option, as well! This post contains affiliate links for products I’m obsessed with. 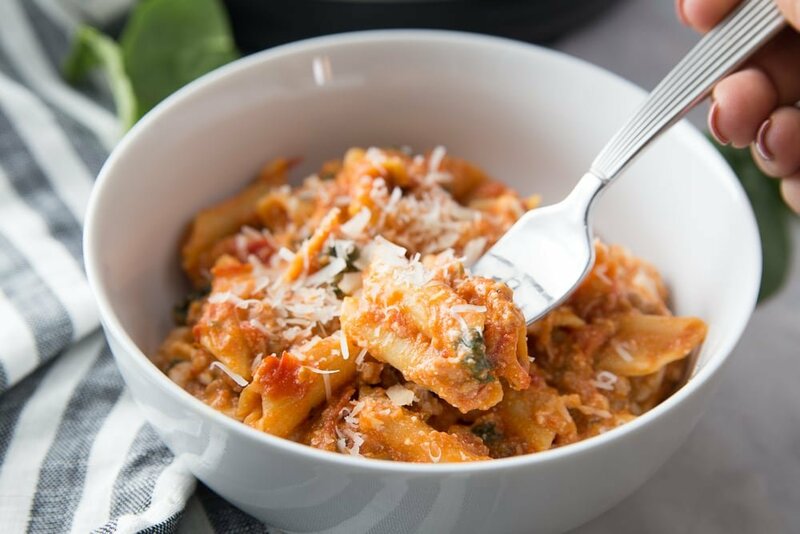 this Instant Pot Baked Ziti is not baked…unless you decided to add that extra step at the end and I honestly, as much as I love me some crispy cheese, do not find it necessary. this is not actually ziti in my bowl. It’s Penne. For some reason, finding gluten-free ziti in my favorite brands proved way too difficult and I’ve honestly wanted to get this post out for months. So I settled for a similarly tubular shaped pasta. 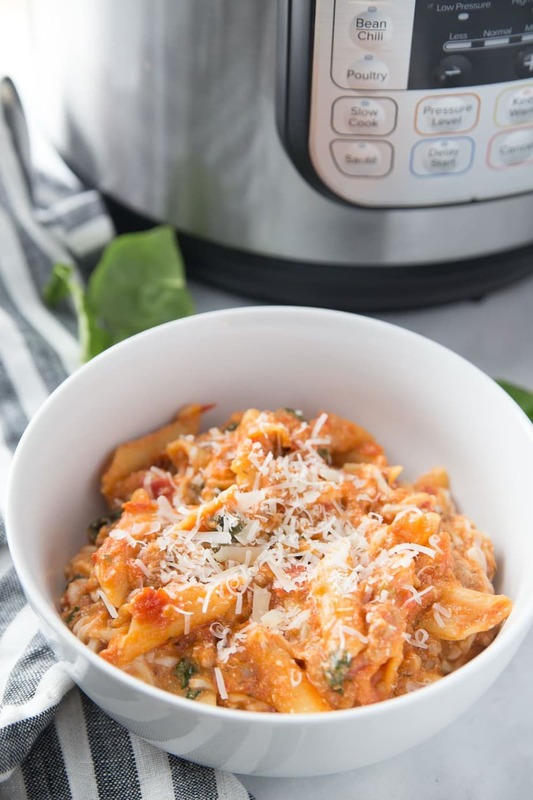 I hope you can overlook these facts and just make this yummy pasta dish – whatever you want to call it – because it’s so darn yummy and as easy as it gets, too, thanks to the magic of the Instant Pot . Truly, it deserves this chance. 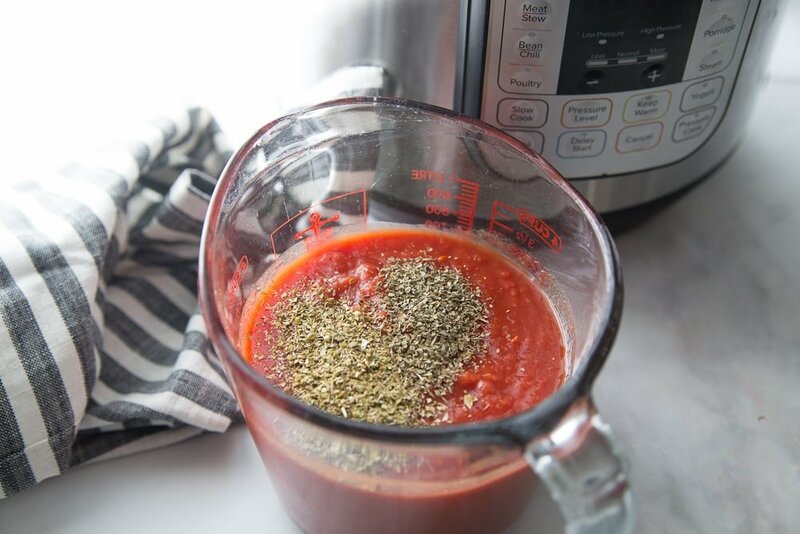 I tested this one a bunch of times (to my husband’s excitement), mainly because I was adamant about using crushed tomatoes instead of pasta sauce, because as much as I LOVE having a jar of my 21 Day Fix Homemade Tomato Sauce handy, sometimes I just don’t. And no sugar added jar sauce can be expensive…and I don’t love the taste of all of them. Not to mention, I almost always have cans of crushed tomatoes stocked in my pantry. It’s one of my staples! Turns out, a regular can of crushed tomatoes with some added spices works like a charm! I did a similar thing with my Italian Chicken Skillet , another quick and easy meal! One of the keys to making Instant Pot dishes with tomato sauce is to keep the sauce near the top of the pot so you don’t trigger a burn notice. 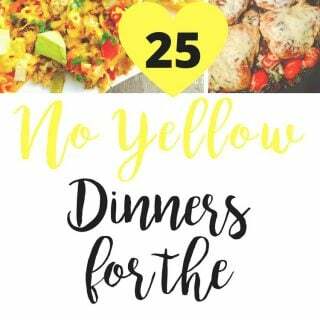 One of the tricks I have learned over time and it has saved many dinners! Check out how I layer the ingredients in this video! So super easy! Don’t have an Instant Pot yet? Guess what…I have three, but this one is my favorite! Is this Baked Ziti Gluten-free? Yes! I used Banza Chickpea noodles for mine because they are full of protein and fiber, but you can use any gluten free pasta you want! 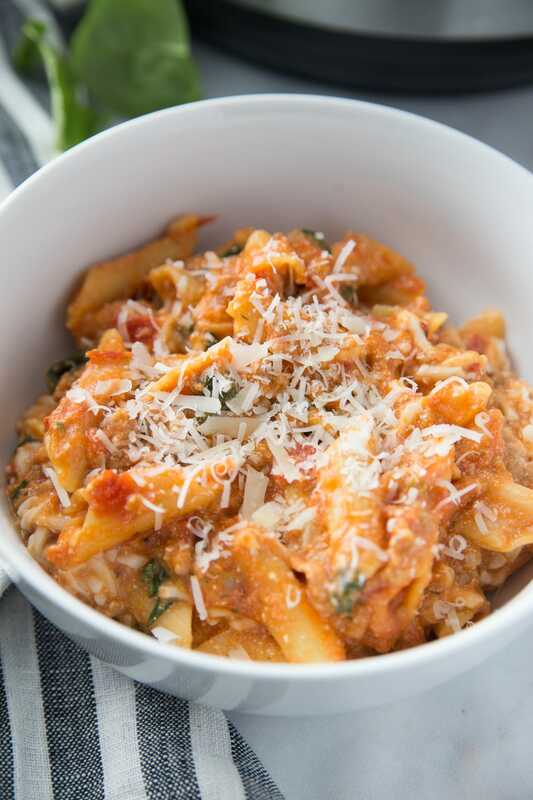 Can this Instant Pot Baked Ziti be frozen? Of course! Just let it cool completely before placing it in an airtight container. You can freeze it for up to three months. 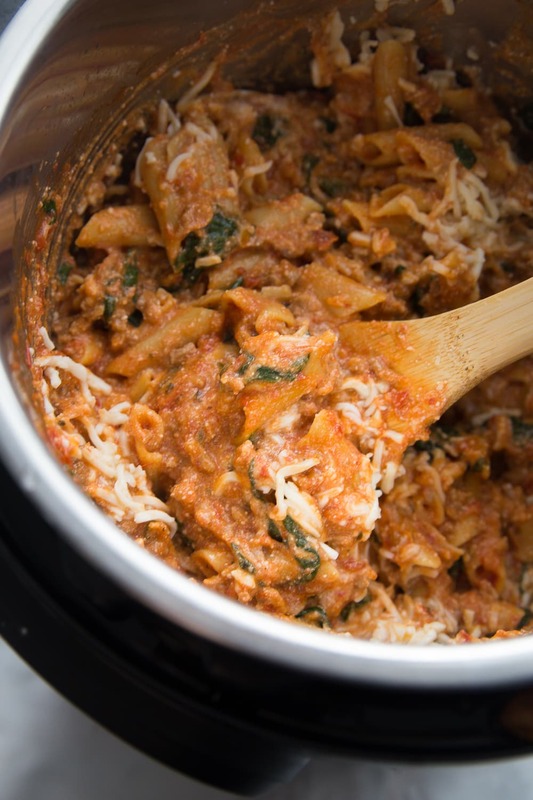 Can I use ground beef or another protein in this Healthy Instant Pot Baked Ziti? Absolutely! I love it just as much with ground beef! You could also use ground turkey or chicken if you prefer! 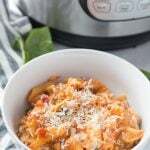 Can I make this Instant Pot Baked Ziti vegetarian? You can definitely make this meal vegetarian…just take out the meat and replace it with your favorite veggies. I love it with squash and cauliflower! I also make this dish dairy free for my son by scooping out his portion before I add the cheeses. He LOVES this dinner! My kids don’t like spinach, can I leave it out? Totally. My kids go through phases where they won’t eat anything green, so I get this!!! I will sometimes replace the spinach with cauliflower rice like in my 2B Mindset Cauliflower Taco Meat and they are none the wiser! 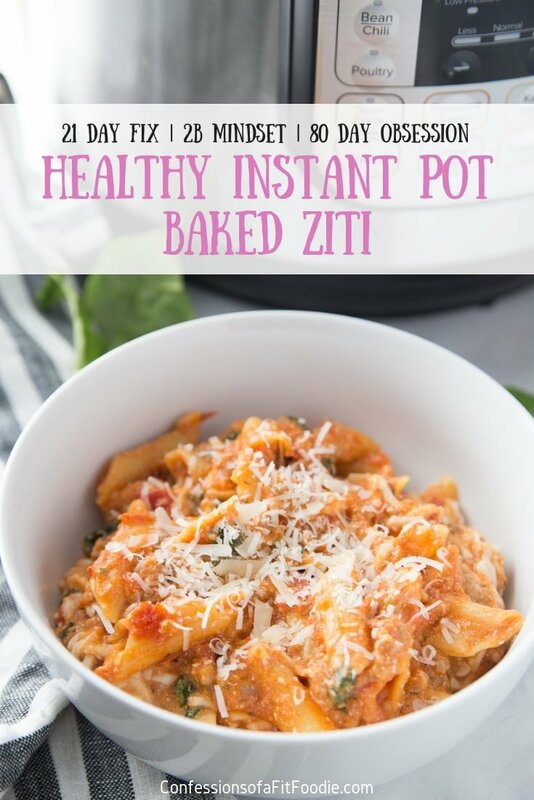 Save time and make this Healthy Instant Pot Baked Ziti for the 21 Day Fix whenever you are craving a bowl of warm and cheesy comfort food! Gluten-free with a dairy free option, as well! 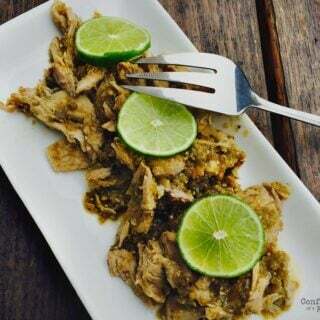 Set Instant Pot to saute and coat with olive oil cooking spray. Add in meat and brown until almost cooked through. Add in diced onions and cook until onions begin to get tender. Drain meat if necessary, then add in olive oil and garlic. Stir and cook until garlic is fragrant. Sprinkle meat mixture with salt. Add water to the Instant Pot and use a wooden spoon to scrape off any brown bits at the bottom of the pot, so you don’t trigger a burn notice. Then layer uncooked pasta over meat mixture. Mix basil and oregano into the crushed tomatoes and then layer that over the pasta. Do not stir! After cook time, do a quick release. When it’s safe and all air has been released, carefully open lid. Give everything a stir, then add in chopped spinach. Allow spinach to wilt for a moment before stirring in ricotta and parmesan cheese. Top with shredded mozzarella and place lid on IP so cheese will melt. Alternatively, you can place the pasta mixture in a broiler safe dish, top with cheese, and broil for a few minutes watching carefully until cheese is brown and bubbly. 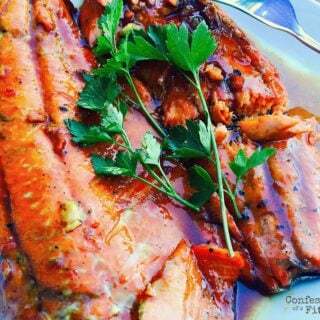 Enjoy with addition parmesan cheese, if desired! Could you use regular pasta in this recipe? We have no allergies and being overseas I sometimes find it hard to find some items. I used to make Baked Ziti for my family, but it was too unhealthy so I haven’t made it for a loooong time. My family is happy to have your delicious dish back on rotation. Thank you!! YAY!! Thank you, Margie!!! I heart you, lady!! When do I add the cauliflower rice? This recipe doesn’t call for it, but you can add it if you want! How would you recommend making this if you don’t have an instapot? I would cook the meat and boil the pasta while it’s cooking…then mix everything together (including the cheese) and bake at 350 until the cheese is melty! I don’t count carbs, but you can use my fitness pal to get that info! Can cottage cheese be substituted for the ricotta cheese? What kind of pasta did you use? Also, what size Instant Pot do you have? Did you get the burn message from the start? Hi Sarah – what size and model pot do you have? Did you get a burn message? 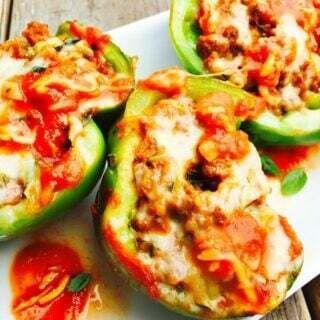 Nancylynn, I love this recipe and you have totally helped me to fall in love with my IP! I have a question about doubling the recipe… can you do that in the IP (6 qt). I’d love to have some in the freezer for lazy weeks! Can you omit the meat? I can’t stand anything but poultry. Would the cooking time change? Sure – maybe add some extra veggies then to bulk it up. And you can keep the time the same! HANDS DOWN the BEST recipe we’ve tried yet!! I followed the directions 100% with exception of using whole wheat rotini instead. After release, I left the lid on for 10 minutes while I made my salad and everything was cooked to perfection. My picky fiancé who normally will pick out ALL veges (no matter how small) ate every single bite and went back for seconds!!! My Mother in law mentioned how tasty it was through the entire dinner and then said she looked forward to having it for lunch the next day. BIG WIN in our home. This dish WILL impress at pot lucks and work luncheons for sure. Ahhh!!! This is awesome, Alexis!! I love when a recipe is so tasty people will willingly eat their veggies!! I made it tonight with whole wheat pasta and used the 10 mins suggested above, with quick release. Worked great! The serving of 1 1/4 Cups equals only 1 yellow with 21 Day Fix? Oh, great! And yes – this makes 6 servings and it’s only one yellow of pasta in that count! So, how long did you cook it for? 4 minutes than 10 minutes of slow release? Just want to get the timing right. I’m using the small whole wheat penne pasta. The bigger penne never seems to cook enough for me (the whole wheat version). Good but noodles were undercooked too. I have IP lux 60. Next time, add a minute! Is there a way to get the nutrition breakdown for this recipe? You can plug the ingredients into My Fitness Pal for info! If we are using whole wheat penne, how long do we cook the pasta in the IP? I have a 6 quart duo. Hi! I would do 4 minutes for whole wheat! I did 4 minutes and it turned out perfect!! Also, if I wanted to add mushrooms for additional veggies, when would I do this (at what step) and for how long do I cook them? Thanks! Hi! I would add them to the meat mixture when you are almost finished with the saute step. Turned out great!! Thank you! I used veggie noodles and it was delicious. Oh, awesome! What kind of veggie noodles?